Showing 20 results on this page out of 81 results. Limrainfosys: Computer Education Summer Offer 50% Fee Discount 7th to PG Student All Computer Courses: Netaji Chowk, Adilabad. &: ☏ . 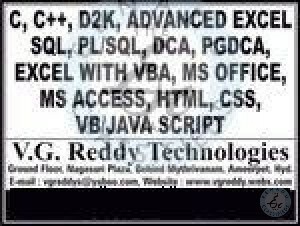 Basics, MS-Office, DTP, Autocad, C, Tally - GST, Typewriting Lower/Higher at Omkars, 2/10, Brodipet, Gnt ☏ . Practicals & Class. M.S.Office, Tally ERP-9, DTP Photoshop, DCA, Autocad, C, C++, Oracle, Java, CAD, Hardware Courses. Batches Starts in Rajiv Computer Institute. ☏ .